A New Map of the West India Isles. 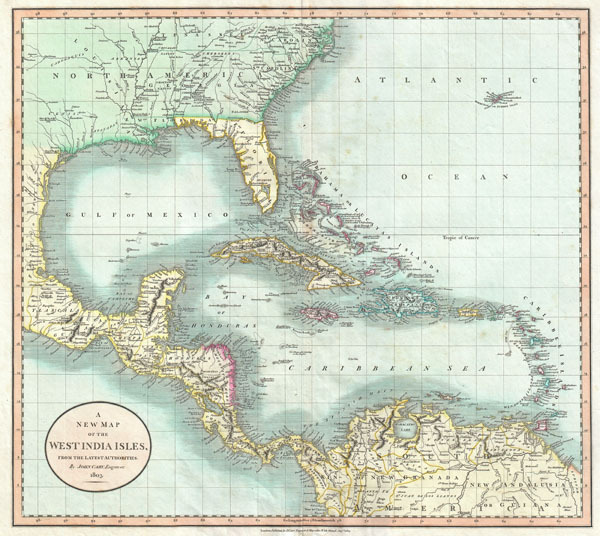 A beautiful example of John Cary's important 1803 map of Florida, Central America and the West Indies. Covers from Texas (called Cenis) eastward to the Carolinas and the Bahamas, and then southward past Florida and the West Indies to include all of Central America and the northern part of South America. Offers superb detail throughout, especially regarding Florida and the Caribbean. In the North America section of the map Georgia is shown extending westward as far as the Mississippi River despite the creation of the Mississippi Territory in 1798. Florida is divided at the Apalachicola River into eastern and western sections. West Florida, ostensibly part of the Louisiana Purchase, was claimed by the Spanish and remained under their control until 1812. Lists numerous place names along the Mississippi River including Davion's Rocks, Ft. Bosalie, Ft. Francis (destroyed in 1729), New Madrid and Old Fort, among others. In modern day Texas, called Cenis here, Cary lists eight place names as well as both the 1685 settlement founded by La Salle on the Gulf coast, and the place further inland where, in 1687, he was murdered. All in all, one of the most interesting and attractive atlas maps of the West Indies to appear in first ten years of the 19th century. Prepared in 1803 by John Cary for issue in his magnificent 1808 New Universal Atlas. Very good condition. Original centerfold. Blank on verso. Rumsey 1657.012. Fitzgerald, J.H., Changing perceptions: mapping the shape of Florida 1502-1982, 120 (1811 ed.). National Library of Australia, MAP Ra 84 Plate 58. Phillips, P. L., A List of Maps of America in the American Library of Congress, p. 1060. Phillips (Atlases) 714 (Atlas). The Map Collector, issue 43, p. 40-47 (Atlas). National Maritime Museum, v. 3, no. 311 (Atlas).